The legislative framework underpinning UK insolvency law2 is principally provided by the Insolvency Act 1986 (IA 1986) and the Insolvency Rules 2016 (IR 2016),3 which apply to both companies and individuals. They also apply in modified form to certain forms of partnership. Elsewhere, 'special insolvency regimes' apply to certain regulated entities, including credit institutions, insurance undertakings and utility companies (see Section I.vi). The IA 1986 and IR 2016 are supplemented by other legislation, such as the Companies Act 2006 (including the statutory provisions relating to schemes of arrangement used in restructurings) (CA 2006), the Company Directors' Disqualification Act 1986 and the Law of Property Act 1925 (which, in some cases, governs the ability of a secured creditor to enforce its security). While European Union law has only a limited effect on the domestic insolvency framework,4 it governs jurisdiction and recognition in many EU cross-border cases. On 23 June 2016, a referendum was held in which the British public voted to leave the EU, and on 29 March 2017 the prime minister gave formal notice of the United Kingdom's intention to withdraw, in accordance with Article 50 of the Treaty on European Union, triggering the two-year period for negotiating the terms on which the UK will leave (which could be extended by mutual consent). As discussed in more detail in Section V.i, it is not yet clear what form the exit will take, or what the legal consequences will be. The existing legal framework is expected to remain in place until the UK leaves (and it is anticipated that transitional arrangements may preserve significant aspects of the restructuring and insolvency framework for a longer period), and is, therefore, still discussed in detail in this chapter. The implications for cross-border insolvency are discussed further in Section V.iv. In the restructuring and insolvency context, the most significant piece of EU legislation is the EC Regulation on Insolvency Proceedings (recast) (No. 2015/848) (the Recast ECIR), which limits the jurisdiction of the English courts to open main insolvency proceedings. The Recast ECIR is directly applicable in all EU Member States except Denmark,5 in cases where the debtor's centre of main interests (COMI) is situated in an EU Member State. It imposes a framework of jurisdictional rules governing the opening of all proceedings that fall within its scope and will override the national law of EU Member States where necessary. Certain types of debtor are excluded from the Recast ECIR, the key examples being credit institutions and insurance undertakings, which are subject to separate regulations. Most provisions of the Recast ECIR came into force on 26 June 2017, following an extensive review and subsequent revision of the EC Regulation on Insolvency Proceedings (No. 1346/2000) (Original ECIR). The Original ECIR continues to govern insolvency proceedings that were opened before that date. Throughout this chapter, we use the umbrella term 'ECIR' where the position under the Original ECIR and the Recast ECIR is the same. Where the ECIR applies, main proceedings6 may only be opened in the UK if the debtor company has its COMI (which is presumed, in the absence of proof to the contrary, to be where the debtor's registered office is located)7 in the UK. The company does not have to have been incorporated in an EU Member State. If the company's COMI is in another EU Member State, secondary proceedings can be opened in the UK if the company has an establishment in the UK.8 Insolvency proceedings opened in an EU Member State under the ECIR will be automatically recognised without any formality in all EU Member States, including the UK, from the time the judgment opening the proceedings becomes effective in the EU Member State in which the proceedings are opened. If the company's COMI is outside the EU, the ECIR will not apply and the UK, in common with other EU Member States, will be free to act in accordance with its existing laws and practice when exercising jurisdiction, opening proceedings and recognising and enforcing proceedings opened within and outside the EU. Changes to insolvency legislation were introduced under the Enterprise Act 2002 to facilitate corporate rescue. Key amendments included the streamlining of the administration regime and the limiting of the circumstances in which the holder of a qualifying floating charge9 (QFC holder) can appoint an administrative receiver to realise its security. These changes reflect the shift in policy voiced by successive UK governments over recent years in an attempt to make the UK a more rescue-orientated, debtor-friendly jurisdiction, where entrepreneurship is to be encouraged and where there should be no stigma attached to business failures in the absence of wrongdoing by the directors of the company. However, when compared with certain other jurisdictions, such as the United States, the UK still appears to be a creditor-friendly jurisdiction. The government has been considering options for the reform of the corporate insolvency framework, including proposals intended to facilitate restructurings and business rescue. As discussed further in Section V.v, it is not clear at present whether these reforms will be pursued. In the UK, the prevailing approach to treatment of businesses in financial difficulties was traditionally to attempt to achieve a consensual solution to keep businesses going. However, the complexity of capital structures, diverse views of different stakeholders and the flexibility of tools such as schemes of arrangement, company voluntary arrangements (CVAs) and pre-packaged administrations (discussed in subsection iii) have meant that solutions that are not fully consensual have become more commonplace. Often these are used as either a 'stick' to encourage consensual negotiations, or to assist with the implementation of a restructuring strategy agreed as part of a broadly consensual process. Subject to the applicability of any special insolvency regimes (see Section I.vi) or any jurisdictional limitations imposed by the ECIR, the processes described below can be used to wind up or rescue a company in the UK. In brief, a company (including an overseas company if its COMI is in England or if the company is otherwise found to have sufficient connection with this jurisdiction)10 may be placed into voluntary or compulsory liquidation, unless it is subject to a special insolvency regime. Alternatively, it may be made subject to any of three alternative statutory procedures: administration, CVA or receivership. In addition, a company may have its debts rescheduled or compromised by way of a creditors' scheme of arrangement (scheme). Unlike liquidation, administrations, CVAs and schemes can be used to rescue a company and may form part of a restructuring plan. The IA 1986 also provides for receivership (including administrative receivership),11 which is a self-help remedy enabling a creditor to recover what it is owed through the realisation of charged assets. A company may be wound up by way of a 'members' voluntary liquidation' (MVL), which is a solvent liquidation, or a 'creditors' voluntary liquidation' (CVL), which is an insolvent liquidation. A CVL can also be used as an exit route from administration. In a CVL, the creditors will have a greater say than in an MVL and are also able to appoint a liquidation committee to supervise certain aspects of the winding up. A company can also be wound up by the courts as a compulsory liquidation. In both a voluntary and a compulsory liquidation, the liquidator is under a duty to collect in and realise the assets of the company for distribution to the creditors. There is no prescribed time limit within which to complete this process. The company will then be dissolved. If the liquidator believes that he or she could achieve a better result for the creditors were the company to be placed in administration, then he or she may apply to the courts for himself or herself or another person to be appointed as administrator. If main proceedings are pending in another EU Member State, and the company's COMI is located in that Member State, it will still be possible to commence a CVL in the UK, provided the company has an establishment in the UK. If, however, main proceedings have already been opened in another EU Member State, the English courts must stay the secondary proceedings in whole or in part if requested to do so by the liquidator in the main proceedings.12 The English courts have the power, however, to request the liquidator in the main proceedings to take any suitable measure to guarantee the interests of the creditors in the secondary proceedings and of individual classes of creditors. Such a request may only be rejected if it is manifestly of no interest to the creditors in the main proceedings. An administrator can be appointed in cases where a company is, or is likely to become, unable to pay its debts and the purpose of the administration is likely to be achieved. The purpose is set out as a hierarchy of three objectives. The primary objective is to rescue the company as a going concern, failing which the administrator must seek a better result for the company's creditors as a whole than would be likely in a winding up. If the second objective is not achievable, the third objective is to realise the company's property for distribution to secured or preferential creditors. The second objective may be achieved by disposing of the company's business or its assets by way of a pre-packaged sale (pre-pack), agreed before an administrator is appointed. The sale will then be effected immediately (or soon after) he or she takes the appointment (the administrator is not required to notify the unsecured creditors in advance or obtain their consent). This has proved to be a useful, if at times controversial, restructuring tool and has on occasion been used by foreign companies, with court approval, after migrating their COMIs to England14 (see Section I.vii). The court held that the industry guidance on the use of pre-packs provided by SIP 1615 had been complied with and expressly gave the administrators liberty to proceed with the pre-pack as, on the evidence, there was no realistic alternative to realising better value for creditors.16 As discussed further in Section V.v, since November 2015, there has been an independent 'pre-pack pool' of experienced business people available to scrutinise proposed deals involving connected parties. Use of the pre-pack pool is voluntary but strongly encouraged. It was set up to address concerns about the fairness and transparency of pre-packs involving connected parties, but has not been extensively used to date. An administrator cannot be appointed to a company whose COMI is located outside the EU unless it is registered under the CA 2006 or is incorporated in a European Economic Area state other than the UK.18 In this respect, the English courts' jurisdiction is narrower than that for liquidations where an overseas company can be wound up if it has sufficient connection with this jurisdiction (as discussed earlier in this Section). The administration will end automatically after one year unless extended by court order or with the consent of the creditors. Extensions are often required in complex cases. A CVA is an informal but binding agreement between a company and its unsecured creditors to compromise the company's debts, made with the aim of allowing companies in financial difficulties to avoid liquidation. If the CVA proposal is approved by three-quarters or more (in value) of the company's creditors, it will bind all creditors who were entitled to vote in the decision-making process, regardless of whether they were in fact notified about it.19 Dissenting creditors and creditors whose votes are required to be left out of account are therefore bound by a resolution of the requisite majority. Secured and preferential creditors will not be bound unless they have given their consent and, therefore, CVAs are less commonly used by companies that have a large amount of secured debt. A CVA may be used to avoid or supplement other insolvency procedures, such as administration or liquidation, where it can take advantage of the moratorium against creditor action. An optional moratorium is otherwise available for certain small companies. It has the advantage of being a flexible restructuring tool, which can often be swiftly implemented20 and requires minimal court involvement. It enjoyed some degree of success in the retail sector at the height of the global financial crisis as a way for a company to reach agreement with its landlords and other unsecured creditors, and as discussed further in Section III.i, has recently become popular again for restructurings in the retail and restaurant sector, particularly where compromises with landlords are required. A scheme of arrangement is not an insolvency process but falls instead within the ambit of the CA 2006.22 It is a court-approved compromise or arrangement between a company and its creditors, or any class of them, to reorganise or reschedule the company's debts. It does not benefit from a moratorium on creditor actions23 but can be implemented in conjunction with formal insolvency proceedings (administration or liquidation), both of which include a statutory moratorium. In its simplest form, a scheme may be used to vary the rights of a class of creditors and can bind dissentient creditors if the requisite majority or majorities vote in favour of the proposal. It can also be used by companies to amend and extend outstanding loans and implement debt-for-equity swaps, where they have failed to obtain the requisite level of consent under the underlying loan facility. It is also sometimes used to provide a breathing space ahead of a wider restructuring,24 or strategically as a 'stick' or 'plan B' in the context of restructuring negotiations to help achieve a consensual deal. The scheme process takes time, although once the proposal document has been finalised and circulated, it may be possible to complete the procedure in approximately six weeks, subject to court availability. Unlike in a CVA (where the creditors effectively vote as a single class), it may be difficult to achieve a consensus among affected creditors as to the composition of the various creditor classes. Class composition will be considered at the convening hearing if there are outstanding issues as to fairness. The fact, however, that it is binding on all members of the relevant class (or classes) of creditors, once it has been approved by the appropriate majorities, sanctioned by the courts and delivered to the Registrar of Companies, gives it an important advantage over a CVA. Schemes are sometimes used by overseas companies,25 often in circumstances where such companies are unable to obtain the requisite level of approval for the compromise in their own jurisdiction. Sufficient connection has been found in a number of cases on the basis of the underlying facility agreement being subject to English governing law and jurisdiction clauses,26 including where the relevant clauses have been changed to English law in anticipation of the scheme.27 The courts will be influenced by whether there is a procedure that is equivalent to a scheme available in the relevant overseas jurisdiction and will also want to be satisfied that the effects of the scheme will be recognised in other jurisdictions. The concern is greater where there are local creditors, opposed to the scheme, who may attempt to ignore its terms and bring claims against the debtor or its assets on the basis of the original (pre-scheme) finance documents (see Section I.vii for further details). The fact that a scheme is neither a purely informal out-of-court procedure nor a formal court-based procedure, and that it falls outside the scope of the ECIR, has led to some difficulties in relation to its recognition by the courts of certain EU Member States. The Recognition and Enforcement of Judgments in Civil and Commercial Matters (No. 1215/2012) (Judgments Regulation) provides one avenue for recognition, although it has not been conclusively determined whether schemes fall within its scope (see Section I.vii for further details). In cases where recognition under the Judgments Regulation is refused by an overseas court (or recognition is sought in jurisdictions where that regulation does not apply), that court may be able, with the benefit of expert evidence where necessary, to recognise the scheme under private international law. The recognition of schemes remains a controversial topic and, usually, it will be necessary for there to be robust expert evidence on recognition if, for example, there are foreign borrowers or guarantors or if some or all of the debt is foreign-law governed. A voluntary liquidation, whether an MVL or a CVL, is initiated by the company's members passing a resolution (requiring a three-quarters majority vote) that must state either that they are in favour of a voluntary liquidation, in the case of an MVL, or that the company cannot, by reason of its liabilities, continue its business and that it is advisable to wind it up, in the case of a CVL. The directors of the company must give prior notice to any QFC holder and to the appropriate regulator under the Financial Services and Markets Act 2000 (FSMA 2000), if the company is an authorised deposit taker under the Banking Act 2009, of their intention to propose a resolution for voluntary liquidation. The liquidation will commence on the date the resolution is passed. In an MVL, the members appoint the liquidator, while in a CVL, the creditors appoint him or her. If, during the course of an MVL, the liquidator forms the opinion that the company will be unable to pay its debts in full, together with any interest, the liquidation will be converted to a CVL. A compulsory liquidation is usually initiated by the presentation of a winding-up petition to the court. This will usually be done by the company, the directors or (more often) a creditor. The grounds on which a court can make a winding-up order include where the company is unable to pay its debts or where a court believes it is just and equitable that the company be wound up. The petition must be advertised, either by publication in the London Gazette or in another manner deemed suitable by the court, at least seven days before the hearing. This will provide notice to creditors and other interested parties who may then attend the hearing and bring to the attention of the court material relevant to whether the winding-up order should be made. If the relevant court is satisfied that the grounds for winding up are met, it will make a winding-up order. The official receiver (an officer of the court) will then automatically assume the role of liquidator until another liquidator is appointed. Receivers and administrators are also able to present petitions and any QFC holder who is entitled to appoint an administrator may apply to the court to have the winding-up order discharged and an administrator appointed. The court may also appoint a provisional liquidator after the presentation of the winding-up petition but before a winding-up order is made. Provisional liquidation is similar in effect to compulsory liquidation (though the court can limit the provisional liquidator's powers). Provisional liquidation remains relatively uncommon but may be useful in certain circumstances, for instance if there are concerns that the directors will dissipate the company's assets between the presentation of the winding-up petition and the making of the winding-up order. A company is placed in administration by either making a filing with the court to document an out-of-court appointment or making an application to the court for a court-based appointment. An out-of-court appointment may be made by the company or its directors. It may also be made by a QFC holder although, for reputational reasons, a QFC holder might prefer the application to be made by the directors. This also has the advantage of placing the QFC holder in the position of being able to influence the selection of the administrator. An application for a court-based appointment may be made by the company, its directors or any creditor. This form of application might be the only route available if a creditor has presented a winding-up petition against the company. In some cases, it may be expedient to seek a court-based appointment: for example, where the proposed administrator wishes to secure court approval for a proposed pre-pack sale of the company or its assets that might otherwise be at risk of being challenged or, in certain circumstances, where there is a cross-border element and there is a concern that the documentation evidencing an out-of-court appointment might not readily be recognised by a foreign court. A court-based application might also be used to avoid the risk of a subsequent challenge as to the validity of an out-of-court appointment on the basis of a procedural irregularity. A QFC holder is able to seek a court-based or out-of-court appointment if an event has occurred that would allow it to enforce its security. This will typically be a default under a loan agreement or loan notes. This right of appointment may well arise when the company is not insolvent. In all other circumstances, it will be necessary to show that the company is or is likely to become unable to pay its debts and to provide an opinion from the administrator that the purpose of the administration is capable of being achieved. Where an administrative receiver is in office, the appointment of an administrator must be made by an application to the court. A court will only make an appointment where the appointor of the administrative receiver consents or where the court thinks that the security under which the administrative receiver was appointed is liable to be released or discharged as a preference or a transaction at an undervalue or that the floating charge is voidable for want of new consideration at the time of its creation. Where a secured creditor retains the right to appoint an administrative receiver, it may use this right to block the appointment of an administrator by appointing an administrative receiver before the appointment of an administrator. A person appointing an administrator must give notice of his or her intention to appoint an administrator to certain persons, including a QFC holder. During the notice period, a secured creditor who retains the right to appoint an administrative receiver may do so or may instead substitute his or her choice of insolvency practitioner as administrator. A QFC holder who does not have the power to appoint an administrative receiver may substitute its choice of insolvency practitioner as administrator even though it cannot block the appointment of an administrator. An interim moratorium on creditor action arises to protect the company where there is a delay between the applicant filing for administration and the order taking effect (where the court-based procedure is used) or where the applicant is required to give advance notice of their notice of intention to appoint an administrator (where the out-of-court procedure is used). A full moratorium will arise when the appointment takes effect. As previously mentioned, in some cases, a pre-pack sale will be agreed before an administrator is appointed and will be effected on, or soon after, he or she takes up the appointment. To enter into a CVA, the directors (or, if the company is in administration or liquidation, the administrator or liquidator), after proposing the CVA to the members and unsecured creditors, will appoint an insolvency specialist (normally an accountant) to act as the nominee.29 The nominee will report to the court whether, in his or her opinion, the proposal should be put to members and creditors30 and, if he or she believes it should, seek the approval of the members at a meeting, and of the creditors by way of a qualifying decision procedure. The CVA can be challenged in court by a creditor or member on the grounds of unfair prejudice or material irregularity (or both). This must be done within 28 days of the filing of the notice of approval with the courts or, if the applicant did not receive notice, within 28 days of the day on which he or she became aware that the qualifying decision procedure had taken place. If there is any uncertainty as regards identifying all the company's creditors, the CVA process is unlikely to be favoured as it may carry the risk of a late challenge from 'hidden creditors'. The scheme process is usually initiated by the company (or an administrator or liquidator if the company is in administration or liquidation). The company must first apply to the court for an order giving permission for a meeting (or meetings) of the affected creditors to be convened to vote on the scheme, although this is generally preceded by the issuance of a creditors' issues letter or 'practice statement' letter to outline the key terms of the scheme and set out the company's views on class and other issues.31 Any creditors unaffected by the scheme (e.g., those that are to be paid in full or whose debts are not required to be compromised) can be excluded from the scheme. Dissentient creditors whose rights are affected by the scheme will be entitled to vote on it along with other creditors in their class, but if the requisite majority has been achieved that class will be bound and the minority view can be disregarded. If the voting majorities are achieved, a further application is made to the court for an order sanctioning the scheme. The scheme will become effective and binding on affected creditors when it is delivered to the Registrar of Companies. Affected creditors will have an opportunity to challenge the composition of a class and raise other creditor issues at the convening hearing.32 In the case of a scheme of an overseas company, the court may also give preliminary consideration as to whether it will ultimately have jurisdiction to sanction the scheme. Any jurisdiction issues will then be considered more fully at the sanction hearing. If objections to the scheme are later raised by a scheme creditor at the sanction hearing, the court may reject them and refuse to grant leave to appeal. If, however, the court considers that an appeal against a decision to sanction the scheme has a reasonable prospect of success, it may grant a short-term stay before making the sanction order (i.e., so that the order cannot be given efficacy by being delivered to the Registrar of Companies for registration).33 The stay then gives the dissentient creditor time to seek permission to appeal to the Court of Appeal. However, in practice it is unusual for a scheme decision to be appealed. If the order sanctioning the scheme has already been granted, and has been given statutory effect through registration, it cannot be altered or terminated otherwise than as provided for by the scheme itself or by a further scheme. The court may set aside a sanction order in cases where it was obtained by fraud, although it will not do so if it is satisfied that the result would be the same had the fraud not been perpetrated. As regards the duties of directors in connection with insolvency proceedings, in the UK, while a company is solvent, the duties are owed to the company for the benefit of present and future shareholders and there is no duty to consider creditors' interests. However, once there is doubt as to the company's solvency, or it becomes insolvent, the directors must consider the interests of the company's creditors to minimise the potential loss to them. If a director continues to trade a business after the point at which he or she has realised, or ought to have concluded, that the company had no reasonable prospect of avoiding insolvent liquidation or administration, and he or she does not take every step to minimise losses to creditors, he or she may be liable for wrongful trading. Similarly, a director may be liable for fraudulent trading if he or she allowed a company to incur debt when he or she knew there was no good reason for thinking that funds would be available to repay the amount owed at the time, or shortly after, it became due and payable. Directors of companies that operate overseas may also be required to act in accordance with the laws of the relevant foreign state, particularly if secondary proceedings are opened in that jurisdiction. The IA 1986 confers on the liquidator or administrator the power to seek a court order against directors for a contribution to the company's assets if his or her investigations reveal instances of wrongful or fraudulent trading and to set aside transactions at an undervalue, preferences and transactions defrauding creditors. Alternatively, he or she is able to assign certain of these claims to third parties, including creditors. In addition, he or she is required, under the Company Directors' Disqualification Act 1986, to submit a report to the relevant secretary of state on the conduct of the directors and former directors of the company that may lead to their disqualification from acting as directors, or being involved in the management of the company, for a specified period. A director who is disqualified may also be required to pay compensation. As regards the role of the court, its involvement in a voluntary liquidation is minimal, while in a compulsory liquidation it will hear the application for a winding-up order. In an administration, on the other hand, the court's involvement varies according to whether the process is commenced by way of a court-based or out-of-court application and whether the complexity of the company's affairs is likely to require the administrator to seek directions. In an out-of-court appointment, the court's involvement is likely to be limited, in an uncomplicated case, to receiving and processing the documents that must be filed at court. In a CVA, court involvement is limited to receiving a report from the nominee whether, in his or her opinion, the proposed CVA has a reasonable prospect of being approved and implemented and whether it should be put to the creditors and members. Notification of the approval (or rejection) of the proposal must then be filed at court within four business days of the members' meeting. Certain entities are excluded from the general insolvency regimes because of the nature of their businesses. They are subject instead to special insolvency regimes that, in some cases, are based on the administration procedure found in Schedule B1 to the IA 1986. Certain banks and analogous bodies may be placed into administration (with some modifications) without a court order so long as the consent of the appropriate regulator under the FSMA 2000 is obtained and filed at court. The regulator is also able to participate in the administration proceedings. In addition, the Banking Act 2009 introduced a special administration regime for failing banks and building societies where government intervention is required.35 More recently, a special administration regime and certain other resolution tools were introduced for investment banks.36 The Financial Services (Banking Reform) Act 2013 amended the Banking Act 2009 and introduced a modified bail-in tool to the special resolution regime, and further amendments were made by the Bank Recovery and Resolution Order 2014 (SI 2014 No. 3329) (among other instruments), which came into force on 1 January 2015.37 Bail-in enables the Bank of England to recapitalise a failed institution by allocating losses to its shareholders and unsecured creditors by writing down or converting their claims to equity in a manner that respects the hierarchy of claims in liquidation.38 It is part of the UK's response to the Bank Recovery and Resolution Directive (BRRD), which came into force on 2 July 2014. The BRRD is designed to ensure that EU Member States have a harmonised toolkit to effectively deal with an unsound or failing credit institution and requires banks to draw up recovery and resolution plans that set out how they will deal with certain scenarios that could lead to failure. It also gives national authorities additional powers to enable them to intervene when an institution faces financial difficulty. In addition to the bail-in mechanism, these include resolution tools to allow the bank to sell or merge the business with another bank, set up a temporary bridge bank to operate critical functions and to separate good assets from bad ones. Special regimes also exist for insurance companies,39 postal services, water or sewerage companies, certain railway companies, air traffic control companies, London Underground public-private partnership companies, building societies and bodies licensed under the Energy Act 2004. There are no special insolvency rules in English law relating to corporate groups. Instead, each company is treated as a separate legal entity.40 The Original ECIR did not contain a framework to deal with the insolvency of corporate groups. Instead, in cases where the COMIs of some or all of the individual group companies were located in the same jurisdiction,41 it was sometimes possible to achieve procedural consolidation of the insolvency proceedings of those companies by placing each of them in an insolvency process in the same jurisdiction (usually that of the parent company's COMI), where the proceedings were managed by the same insolvency office holder. The Recast ECIR has expanded the framework for the coordination of insolvency proceedings concerning different members of the same group by obliging the insolvency practitioners and courts involved in the different proceedings to cooperate and communicate with each other. In addition, it gives the insolvency practitioners involved in such proceedings the procedural tools to request a stay of the various other proceedings and to apply for the opening of group coordination proceedings. 'Group coordination proceedings' are a new concept introduced by the Recast ECIR, which involve the appointment of an insolvency practitioner to act as 'group coordinator' to propose a coordination plan setting out an integrated solution for the group companies subject to relevant insolvency or restructuring processes. Group companies do not have to participate, however, and participating insolvency practitioners are not obliged to follow the group coordinator's recommendations or the group coordination plan. It is too early to assess how effective these provisions will prove in practice and how frequently corporate groups will take advantage of the group coordination tools. Under the Original ECIR, it was also sometimes possible to streamline the insolvencies of corporate groups by opening main proceedings in one jurisdiction and effectively preventing the opening of secondary proceedings in other EU Member States by agreeing to respect local priorities (thereby achieving the same outcome for local creditors)42 or by postponing the opening of secondary proceedings until a global sale has been completed.43 The Recast ECIR formalises this practice, including provisions enabling insolvency practitioners to give an undertaking to creditors to respect local priorities, and allowing the courts to postpone or refuse the opening of secondary proceedings in some circumstances if they are not necessary to protect the interests of local creditors. The group coordination provisions broadly received the endorsement of UNCITRAL, which has itself produced a framework for legislation in relation to the insolvency of enterprise groups.44 Another initiative encouraged by UNCITRAL is the use of cross-border protocols to facilitate cooperation between courts and practitioners.45 An early example of this approach was seen in the Maxwell Communications Corporation case, where the UK administrators entered into a protocol with the examiners in the US Chapter 11 proceedings. More recently, attempts have been made to use cross-border protocols (which, rather than being legally enforceable, provide guidelines for cooperation) in certain insolvency situations, such as the Lehmans and Madoff insolvencies, with mixed success. As mentioned in Section I.i, their jurisdiction may be fettered by the ECIR if the company's COMI is situated in an EU Member State, in which case the court of that state will have jurisdiction to open insolvency proceedings. Before the entry into force of the Original ECIR, if a foreign company was found to have sufficient connection with England, a court could exercise its discretion to wind up that company as an unregistered company under Section 221 of the IA 1986 (see Section I.iii). That jurisdiction is now precluded by the ECIR, although the test remains in place for companies that fall outside its scope. In Re Arena Corporation Ltd,47 for example, the English court found that a company incorporated in the Isle of Man but with its COMI in Denmark48 had sufficient connection with England (in the form of assets located in England) to enable it to exercise its jurisdiction under Section 221 of the IA 1986 to wind up the company. Cases such as these, which do not meet the ECIR's jurisdictional requirements, will be subject to the relevant national law and will be recognised by EU Member States and non-Member States alike in accordance with the rules of private international law. If the debtor's COMI is outside the EU, the ECIR will not apply and the UK, like other EU Member States, will be free to act in accordance with its existing laws and practice when exercising jurisdiction, opening proceedings and recognising and enforcing proceedings opened within and outside the EU. It will not be possible, however, to take advantage of the associated provisions under the ECIR, such as automatic recognition in all EU Member States, which are available where main proceedings are opened. This may prove to be a hurdle in group restructurings if some of the debtor companies have substantial connections with one or more EU Member States but fall outside the scope of the ECIR because their COMIs are not situated in an EU Member State. Alternatively, the English courts may offer relief and assistance under Section 426 of the IA 1986, which provides for cooperation both between jurisdictions within the UK and between the UK and other designated jurisdictions, which mainly include Commonwealth countries. In circumstances where the ECIR, the CBIR and Section 426 of the IA 1986 are not applicable, the English courts have an inherent jurisdiction to cooperate with foreign insolvency representatives and recognise foreign proceedings. The granting of recognition will depend on whether the foreign office holder has satisfied the common law principles developed by the English courts. This area was considered in detail by the Supreme Court in Rubin v. Eurofinance51 where an attempt was made to extend the circumstances in which recognition and assistance would be granted by the English courts. In a number of cases, foreign companies have migrated their COMIs to the UK in order to take advantage of the UK's established insolvency and restructuring processes. This kind of forum shopping has received judicial support at EU level,52 with a clear distinction being made between its use to ensure that the COMI is located in the best place to reorganise the company and its group for the benefit of creditors and, possibly, other stakeholders ('good' forum shopping),53 as opposed to its use where the company acts for selfish motives to benefit itself or its shareholders or directors at the expense of creditors ('bad' forum shopping). The decision in Hellas Telecommunications (Luxembourg) II SCA,54 where a Luxembourg entity moved its COMI to England three months before entering administration, is significant for its consideration of what is required to effect a successful migration.55 The court heard that, at the same time as moving its head office, the company also informed creditors of the change of address to London, made a press announcement that its activities were moving to London, opened a London bank account, registered at Companies House as a foreign company and appointed UK-resident individuals as directors of the English company that became its general partner. The court found that, on the evidence presented to it, the presumption in the Original ECIR that the company's COMI was in Luxembourg was rebutted.56 It noted that the purpose of the COMI was to enable creditors in particular to know where the company was located and where they would be dealing with it, finding 'one of the most important features of the evidence' to be that all negotiations between the company and its creditors had taken place in London. A cross-border issue also arises in situations where foreign companies, without migrating their COMIs to the UK, make use of an English law scheme of arrangement to compromise or amend the terms of their debt documents. The key issues to be considered include whether the English courts have jurisdiction over the foreign company and whether the scheme will be recognised in the foreign jurisdiction. For example, in such cases, there remains some uncertainty as to the extent to which the Judgments Regulation may affect the English courts' jurisdiction to sanction the scheme. Judges have generally avoided reaching a firm conclusion as to whether that regulation applies to schemes, instead getting comfortable that, on the facts of each case, even if the regulation were to apply, one or more of the exceptions to the general rule that persons should be sued in the Member State in which they are domiciled would apply so that the English courts have jurisdiction. In many cases, the relevant finance documents have contained a clause conferring jurisdiction on the English courts (most were one-way exclusive jurisdiction clauses but a non-exclusive jurisdiction clause has also been found to be sufficient). In a case concerning the Van Gansewinkel Group,57 Snowden J took the view that if the jurisdiction provisions of the Judgments Regulation apply to schemes (a point that was not decided) then, in that particular case, it would not limit the court's jurisdiction to sanction the scheme. If they did apply, he was entitled to regard all scheme creditors as coming within the jurisdiction of the English court under Article 8(1) of Chapter II, which provides that a party may be made a party to proceedings in another EU Member State if one or more of the co-defendants are domiciled in that Member State and it is expedient to hear the claims against all the defendants in a single court.58 However, he noted that a one-sided exclusive jurisdiction clause for the benefit of the scheme creditors did not amount to submission by those creditors to the jurisdiction of the English court. Therefore, if the jurisdiction provisions of the Judgments Regulation apply to schemes, these schemes could not be brought within the jurisdiction of the English court by virtue of Article 25(1) of Chapter II. Finally, there is some ongoing debate over the meaning of the term 'judgment' in Article 32 of that Regulation in relation to schemes. Despite the wide scope that the term is given by Article 32, some commentators have argued that the procedure for implementing an English scheme is not adversarial in nature and that the sanction order is not, therefore, a judgment and should not be granted recognition under that regulation. There is likely to be further English and European case law on this topic as schemes remain a popular restructuring tool. The past year has seen a significant number of restaurants and bricks-and-mortar retailers restructure using CVAs, in particular in order to address lease portfolios that they feel have become unsustainable in light of the challenging conditions on the high street and the continued rise of online retail. The four examples below illustrate this trend, although for Toys R Us the CVA did not ultimately prove sufficient to save the business. Toys R Us was a retailer, founded in 1948, whose main business was the sale of toys. Its global retail presence included stores in over 30 countries, including more than 100 stores in the United Kingdom. On 18 September 2018, Toys “R” Us, Inc, the parent company of the group, and certain of its American and Canadian subsidiaries, filed for Chapter 11. The group's UK business also struggled with competition from online retailers and the impact of tight margins given the cost of its stores. Accordingly, Toys R Us UK sought to reduce its store rental costs using a CVA announced on 4 December 2017. The proposed CVA would have included the closure of at least 26 stores, likely to be the larger loss-making warehouse outlets. Jamie's Italian was established in 2008. Jamie's Italian restaurants operate under the well-recognised Jamie Oliver brand, and are priced towards the upper end of the high street chain Italian restaurants. A number of factors affected the performance of the business, including a legacy of underinvestment in certain older restaurants, investment in locations that proved to be unsuitable for the product offering and commitment to sites with high occupancy costs. At the same time, conditions in the 'casual dining' market have become increasingly challenging in the UK: labour costs and business rates have risen, while consumer spending power and confidence have decreased. Recent rapid expansion in the sector means that it is particularly competitive, leaving businesses little scope to pass on increased costs to consumers. These difficulties have also affected a number of other restaurants in the same mid-market sphere, such as the burger restaurant chain Byron and the Italian restaurant chain Prezzo. Mothercare plc is a UK-listed retailer specialising in clothes and general merchandise for children and expectant parents. Its business has been affected by the changing shopping habits of its customers, who are increasingly shopping online rather than in high-street outlets, as well as by other unfavourable conditions in the retail industry, such as the rising costs of labour and business rates. In order to put the business on a more sustainable footing, two of Mothercare's subsidiaries entered into CVAs. Mothercare also revised its committed debt facilities and entered into new shareholder loans and a new debtor backed facility. The companies that entered into CVAs were Mothercare UK Limited and Early Learning Centre Limited. The aim of the CVA proposals was to restructure Mothercare's property portfolio, creating cost savings, and removing legacy loss-making stores. These companies' property leases were divided into four categories, each of which received different treatment under the CVA proposals: the first group comprised sites where the rent was not reduced, but would be paid on a monthly instead of a quarterly basis; the second, sites that were underperforming and where the rent was reduced by 50 per cent; the third, sites that were underperforming, where the company is able to exit the sites by 1 June 2019, with the rent reduced to 30 per cent for the interim period, and the final group, sites where the relevant lease had expired but there were outstanding dilapidations liabilities. Here the dilapidations liabilities were compromised in exchange for 5 per cent of the final monthly rent of the relevant lease. The CVA proposals also compromised certain intra-group balances.82 The completion of Mothercare UK Limited's CVA proposals was a condition to some elements of the refinancing. New Look is a 'fast-fashion' brand with 593 stores in the UK and 302 stores across Europe, China and Asia. New Look has suffered from a challenging trading performance in a difficult retail environment, which has again been affected by factors such as online competition and weaker consumer confidence. Carillion plc was a construction services and facilities management business. A large part of its work was as a supplier to the UK public sector, including 450 contracts with the government across a range of sectors such as healthcare and infrastructure.90 Carillion entered compulsory liquidation in January 2018, along with 26 other companies in the group.91 The official receiver is acting as liquidator, and PwC has been appointed as special manager. Special managers are persons appointed by the court to provide assistance, support and expertise to an office holder such as the official receiver. The liquidation followed a series of announcements by Carillion concerning its financial stability. Beginning on 10 July 2017, the company announced that a review of the group's contracts had produced an expected contract provision of £845 million. This announcement indicated that there had been a deterioration in cash flows from construction contracts, and a working capital outflow because of the higher than normal completion of construction contracts without replacement. On 29 September 2017, Carillion released its 2017 half-year results; this established a total provision92 in relation to its contracts of £1.045 billion, a goodwill impairment charge of £134 million in respect of UK and Canadian construction businesses, and an average net debt of £694 million. Between its half-year results and its eventual liquidation, Carillion sought to enact a number of measures in an effort to improve its working capital and reduce its net debt, including the proposed sale of its UK healthcare facilities management business, the sale of the economic interest in the group's Omani business, Carillion Alawi, and a suspension of dividends. During this period, Carillion continued to negotiate for a further £140 million of committed credit facilities, initially announcing on 29 September 2017 that a term sheet had been agreed with five lenders. On 24 October 2017, the company confirmed that two committed facilities for an aggregate £140 million had been signed. These facilities were available to be drawn immediately, and comprised a £40 million secured facility maturing in April 2018 and a £100 million unsecured facility maturing in January 2019. The company also agreed new committed bonding facilities, the deferral of PPN repayments and certain pension contributions. In aggregate these provided for an increase in committed headroom of between £170 million and £190 million. The company also continued to win new contracts throughout this period. These included contracts with key stakeholders; such as the government, which awarded a £1.4 billion railway contract to a joint venture partnership, in which Carillion was a member. In its 29 September 2017 interim results announcement, Carillion indicated that it expected to be compliant with its end-of-year financial covenants. However, in November 2017 the company announced that it expected certain contract claim recoveries and business disposals to slip beyond 31 December 2017, which, when combined with lower than expected margin improvements across UK service contracts and a number of other factors, would mean that profits for the full year would be materially lower than current market expectations. The board, therefore, expected that the company's financial covenants tested at 31 December 2017 would be breached. The company sought to defer the covenant testing date to 30 April 2018, by which time it expected to be implementing a recapitalisation plan. Consent to such deferral was received, and became effective, on 22 December 2017. Carillion continued to negotiate with its stakeholders, including a presentation of its business plan on 10 January 2018. As of 12 January 2018, the company expected that an agreement might be reached involving a capital raise and a debt-for-equity swap. Discussions continued with key financial and other stakeholders, including the government, in which the company sought short-term financial support to enable it to continue to trade. These efforts were ultimately unsuccessful, and so the board decided to enter compulsory liquidation on 15 January 2018. As yet, it is too early to predict the level of recovery, if any, for Carillion's creditors; however, it is clear, as reported by the special managers, that there is unlikely to be any return for Carillion shareholders. In the Lehman Brothers International (Europe) (LBIE)93 administration, the surplus of monies available for distribution after payment of ordinary unsecured claims has given rise to a number of novel and difficult legal questions about entitlement and order of priority, which have been examined in the Waterfall cases. in September 2017, a subordinated creditor launched a challenge against the decision of the administrators to admit a proof for an agreed amount, the largest admitted claim in the administration. The scheme will render these proceedings unnecessary. Following the scheme, the administrators announced on 2 July 2018 that LBIE could pay all statutory interest entitlements in full. The scheme does not end the administration, as it did not resolve all outstanding issues. For instance, litigation is still ongoing to determine whether statutory interest is 'yearly interest' for the purposes of the Income Tax Act 2007, and, therefore, whether LBIE is subject to an obligation to withhold amounts representing UK income tax from payments of statutory interest that it makes to creditors. One issue that was resolved separately, and before, the scheme is the Waterfall III application. The administrators applied to court on 25 April 2016 seeking guidance as to the scope of any contribution claims LBIE may make against its members and related issues. This ultimately led to a commercial settlement, which became effective on 6 September 2017, and the Waterfall III proceedings were dismissed on 20 December 2017. In June 2017, the High Court heard an application brought by the foreign representative of OJSC International Bank of Azerbaijan (IBA), the largest commercial bank in Azerbaijan, for an order recognising the restructuring proceedings IBA had entered into under Azeri law as a foreign main proceeding under the CBIR. The court was satisfied that the criteria for recognition were met. Under the CBIR, an automatic stay arises when recognition is granted. The court used its discretion to substitute a wider moratorium, very similar to that under an English administration, as has become common practice in this jurisdiction when the foreign procedure is a restructuring procedure rather than a liquidating one. The moratorium prevented creditors from commencing or continuing any action against IBA or its property without the permission of the court. IBA proposed a restructuring plan pursuant to the restructuring proceedings, which received the requisite approvals and was consequently binding on all creditors as a matter of Azeri law, including those who did not vote, and those who voted against the plan. Two non-participating creditors, whose claims against the bank arose out of instruments governed by English law, argued that the plan did not bind them, relying on the case law derived principle of English law known as the 'rule in Gibbs', which provides that an English law governed debt cannot be discharged by a foreign insolvency proceeding, and asserting that they retained their rights to enforce their English law claims, subject only to the moratorium granted under the CBIR. The Azeri procedure was due to come to a close at the end of January 2018, at which point the moratorium would expire. The foreign representative, therefore, made another application to the court, seeking to extend the moratorium indefinitely, to prevent the creditors destabilising the plan by enforcing against IBA's assets once the moratorium fell away. This application brought into sharp focus the tension between the rule in Gibbs and the concept of modified universalism. In essence, the court needed to decide whether it had the power to grant a permanent moratorium to prevent a creditor enforcing English law contractual rights in a way than ran contrary to the terms of a foreign insolvency proceeding that was binding on all creditors under the relevant foreign law. The court found that it did not have such jurisdiction under the CBIR, because that relief, though procedural in form, would have in all likelihood had the effect of determining the substantive rights of the creditors in question. The court did not have jurisdiction to grant what was in effect substantive discharge or variation of an English law right by the expedient of procedural relief that, as a practical matter, would conform the rights of English creditors with the rights they would have had under the relevant foreign law. Permission to appeal was granted, and, in a subsequent hearing, the court decided to lift the moratorium in part. The decision to lift the moratorium followed on naturally from the court's decision that it could not extend it, but lifting it fully ahead of the appeal risked rendering the appeal pointless. As at the time of writing, the appeal has not yet been heard. As discussed in Section I.i, the British public voted to leave the EU on 23 June 2016, and on 29 March 2017 the Prime Minister, Theresa May, gave formal notice of the United Kingdom's intention to withdraw, triggering the two-year period for negotiating the terms on which the UK will leave. Negotiations on a withdrawal agreement96 are continuing. If implemented, it will cover matters such as citizens' rights, the financial settlement between the UK and the EU, and arrangements for the transition period (see further Section V.iv for the transitional provisions relating to restructuring and insolvency). It is currently envisaged that the withdrawal agreement will enter into force on 30 March 2019, and that the transition period will run from that date until 31 December 2020. It is intended that the withdrawal agreement will refer to a political declaration setting out an overall understanding of the framework for the future relationship between the UK and the EU, but the withdrawal agreement itself will not govern that relationship, and it is highly unlikely that the details will be agreed before the UK leaves. As at the time of writing, the nature of the relationship has not yet been agreed. On 6 July 2018, following a Cabinet summit, the government announced that it intended to seek a 'soft' Brexit deal, under which a UK–EU free trade area for goods and agricultural products would be created, underpinned by a treaty in which the UK committed to adopt new EU rules for goods. Services would be treated separately and would not be as closely aligned. The borders between the UK and the EU would be treated as a combined customs territory, and the UK would charge EU tariffs on goods destined for the EU, but remain free to apply domestic tariffs for goods remaining in the UK. The arrangement would leave the UK free to seek separate trade agreements with non-EU countries. At the time of writing, detailed negotiations with the EU on the proposal are yet to begin, and it remains to be seen whether the outlines of this deal will prove acceptable. At the same time, there is still significant disagreement domestically, even within the governing Conservative Party. The announcement of the deal prompted the resignation of the Secretary of State for Exiting the European Union (informally known as the Brexit Secretary) and the Foreign Secretary, and further resignations have followed. It is possible that continuing disagreements among Conservative MPs could lead to the proposals being revised, or even destabilise the government and result in a leadership challenge and, potentially, an early general election. The uncertainty surrounding the process is, therefore, likely to continue for some time to come. It is very difficult to predict the extent to which the uncertainty generated by the Brexit negotiations will affect the markets over the coming year. Although the economy has proved more resilient than some commentators feared, growth remains sluggish, and there are various indications that consumer confidence remains low, which may increase the pressure on consumer-facing sectors. As the end of the negotiation period approaches, the markets will remain focused on the shape of the future relationship between the UK and the EU, and greater turbulence may follow if market participants regard the developing deal as unfavourable, or if an orderly exit looks unlikely. In recent weeks, businesses have increased pressure on the government to make progress on negotiations or risk losing jobs and investment. For the time being, however, the debt markets remain liquid and terms for borrowers generally advantageous, although financing costs have risen over the past year. If the uncertainty generated by Brexit does not lead to a general economic slowdown, it is likely that sector specific factors rather than overall market conditions will drive restructurings over the coming year, with some consumer-facing sectors likely to continue to come under increasing pressure. As illustrated in Section II.i, restaurants are facing particularly challenging conditions. The sector grew rapidly in recent years, and the pressures of increased competition are now being exacerbated by weakening consumer demand. At the same time, input costs are increasing, with sterling depreciation driving up the prices of imported ingredients and the national living wage (an obligatory minimum wage introduced in 2016 and anticipated to rise faster than its predecessor, the minimum wage) driving up labour costs. The competitive environment makes it difficult for businesses to pass on these increased costs to consumers, so profit margins are likely to continue to fall. Similar pressures are also affecting the retail sector, which is likely to remain under strain if consumers continue to rein in their spending. At the same time, online sales continue to erode the market share of the traditional high street retailers, and chains with large lease portfolios that have failed to adapt their business models are likely find that they are not well placed to weather current market conditions. The construction and facilities management sector also remains under scrutiny, particularly after the collapse of construction and outsourcing business Carillion (see further Section III.ii). Declining housebuilding is also increasing pressure on the sector, while Brexit uncertainty has led to some projects being delayed or cancelled, and may be making some firms reluctant to make significant investment decisions. Sterling depreciation has led to rising input costs on imported materials, putting pressure on margins. Parts of the construction industry rely heavily on outsourcing, a business model that may drive down margins, further exacerbating the challenges the sector faces. There has also been a decline in the number of real property transactions, which is likely to have an impact on estate agency businesses. The shipping sector continues to show some signs of stress on account of overcapacity, and further restructurings may follow. The problems in the oil and gas sectors have abated to some extent as the oil price has stabilised, and the trend away from restructuring towards consolidation and M&A activity is likely to continue. However, some commentators believe that the decline in offshore exploration capex requirements is structural, but that the market has not yet adjusted, and that assuming demand does not return and absorb the excess capacity, further restructurings could follow in the sub-sectors affected. Depending how negotiations progress, parts of UK industry, such as the automobile sector, that are particularly vulnerable to a Brexit model that leads to trade tariffs and border delays, may also come under increasing pressure, which could lead to delays in investment decisions and, potentially, relocations; this in turn could have a knock-on effect on the supply chain. As discussed in Section III.i, a significant number of high street retailers and restaurant chains are using CVAs to restructure, in particular to agree more favourable terms and conditions for their lease portfolios and to address legacy portfolios that are unsustainable under current market conditions. This is a trend that is likely to continue, as the pressures in these sectors show no signs of abating. However, as CVAs have grown more popular in these sectors, the treatment of landlords has come under increasing scrutiny, and it is possible that we will see more vocal and robust opposition to proposals from landlord groups over the coming year. Corporate groups with a cross-border presence continue to stress-test a range of restructuring options across the jurisdictions they operate in before deciding how to proceed. Companies with a mixture of English and US law-governed debt in their capital structures continue to weigh up the advantages and disadvantages of US Chapter 11 proceedings and English schemes of arrangement. In general, companies with mixed capital structures may potentially lean more towards Chapter 11 if they need to undergo a significant operational restructuring, particularly in light of the protections available for directors. However, schemes remain a go-to option for financial restructurings, including those involving both English and US law-governed debt. Schemes of arrangement also remain a popular restructuring tool within Europe. Although there has been more interest in the reformed restructuring regimes in certain other European countries such as Spain, this has not yet translated into serious competition for the UK scheme. In the long term, we may see more restructurings taking place in their 'home' jurisdictions, particularly if further EU Member States introduce more effective restructuring procedures into their regimes and/or Brexit makes recognition more complicated in some jurisdictions, and a corresponding decrease in the use of schemes by foreign companies (particularly where complex engineering is required to bring the company within the jurisdiction of the English courts). However, in the short term, we do not expect the reformed regimes to pose a significant challenge to the scheme's popularity as it will be some time before they are entrenched (or, in the case of new procedures, designed and legislated for) and any teething problems and ambiguities addressed, and, in the interim, many creditors are likely to prefer the tried and tested appeal of the established scheme, in the absence of significant pull factors. As discussed in Section I.i, the domestic insolvency regime is largely unaffected by EU legislation, and we would not expect significant legal changes to be required when the UK leaves the EU. However, the framework of mutual recognition of proceedings and judgments provided by the ECIR is very significant for insolvencies and restructurings with an EU cross-border element. EU legislation also provides a framework for the recognition of bank resolutions and insolvency proceedings. The existing framework remains in place during the two-year negotiating period in the run up to Brexit. The latest draft of the withdrawal agreement97 anticipates that the ECIR and the Judgments Regulation will cease to apply at the end of the transition period. During the transition period, the ECIR will apply to insolvency proceedings provided that the main proceedings were opened before the end of the transition period, the Judgments Regulation will apply to the recognition and enforcement of judgments given in legal proceedings instituted before the end of the transition period, and the provisions of the Judgments Regulation regarding jurisdiction will apply to legal proceedings instituted before the end of the transition period. However, the withdrawal agreement, and the nature of the exit itself, are still the subject of intense negotiation. The government may at some stage seek to agree a permanent alternative framework for the recognition of insolvency proceedings and judgments, either with individual EU Member States or with the EU as a whole. If an alternative framework is not agreed, domestic law would be applied to determine whether the UK courts could take jurisdiction over a company seeking to make use of an English procedure, and the likelihood of that procedure being recognised in other Member States would need to be determined jurisdiction by jurisdiction. As described in Section I.vii, other bases for bilateral recognition do exist, such as the UNCITRAL Model Law on Cross-Border Insolvency, though not many EU Member States have implemented legislation based on the Model Law. The need to approach each jurisdiction on a case-by-case basis would certainly add complexity to cross-border restructurings, but might also allow the English courts to take a more flexible approach when deciding whether they could take jurisdiction; this ability is one of the aspects of the scheme of arrangement procedure that makes it an attractive restructuring tool. The direct impact on the scheme of arrangement procedure itself is likely to be less significant. As discussed in Sections I.iii and vii, schemes fall outside the ambit of the ECIR, and English law is used to determine jurisdiction. However, it has not been decided whether schemes fall within the Judgments Regulation. If alternative arrangements are put in place that closely replicate this regulation, the ambiguity is likely to continue. If not, it would fall away once the transition period ends. On the one hand, one route to recognition would have been removed, and recognition and enforcement would need to be considered on a jurisdiction-by-jurisdiction basis; on the other hand, concerns that the regulation might limit the English courts' jurisdiction to sanction schemes in certain circumstances would also fall away (although they would still need to be satisfied that the scheme would be recognised by some other route in the relevant EU jurisdictions). The government has also indicated that it wants to continue to participate in the Lugano Convention after the UK leaves the EU. The Lugano regime is the predecessor to the Judgments Regulation (although it is not identical and does not incorporate the revisions that have been made to the original Judgments Regulation), and may provide an alternative route for scheme recognition in the absence of the Judgments Regulation. However, unless the UK becomes a member of EFTA (in which case there is a simplified accession procedure), accession would require the approval of all contracting parties, including the EU. At present, uncertainties about jurisdiction and recognition do not appear to be affecting the popularity of the UK as a restructuring destination, although it is possible that this could change closer to the end of the transition period if it looks unlikely that a replacement framework will be put in place. It is still too early to say whether leaving the EU will have an adverse effect on the restructuring and insolvency market in this jurisdiction in the long term. If the UK does not continue to participate in the ECIR framework, or agree a similar replacement framework, cross-border procedures that were previously within its scope will increase in complexity, which might affect their attractiveness in a cross-border context. On the other hand, schemes of arrangement are extremely popular despite the need to consider recognition and jurisdiction on a case-by-case basis, and it is possible that if the English courts' jurisdiction in other proceedings is unfettered, they might in fact increase in popularity in certain circumstances. The government is considering various options for reform of the domestic insolvency framework. Some of the suggestions are quite significant, and if enacted could represent the most significant changes to the domestic insolvency framework since the Enterprise Act 2002. However, it remains to be seen whether legislation will follow from the various consultations and review exercises that are under way. increasing the availability of rescue finance. The consultation closed some time ago, and it still remains to be seen whether legislative proposals will follow. In March 2018, the government indicated that it was continuing to engage with various parties on the issues raised in response to the consultation, and that it would set out its planned course of action later this year. As discussed in Section I.iii, in November 2015, a 'pre-pack pool' of experienced business people was established to scrutinise pre-packaged administration sales involving connected parties. This flowed from a government commissioned review into pre-pack sales, which concluded that although in general pre-packs can be an effective restructuring tool, measures could be taken to improve transparency in deals involving connected parties. Connected party purchasers are now encouraged, on a voluntary basis, to submit an outline of the proposed deal to the pool for review, along with supporting documentation. The process is intended to be quick and cost-efficient: the pool member offers one of three opinions on the proposed sale, and does not comment further (that the case for the pre-pack is not unreasonable; that the case for a pre-pack is not unreasonable but there are minor limitations in the evidence provided; or that the case for the pre-pack is not made). In its latest annual report,98 the pre-pack pool noted that the rate of referrals fell from one in four eligible cases in 2015–2016 to closer to one in 10 in 2017. The government has indicated that it is undertaking an assessment of the impact of the pool (along with the other recommendations contained in the original review, which the market was encouraged to adopt on a voluntary basis), with a view to deciding whether to exercise certain 'reserve powers' to pass measures to regulate administration pre-pack sales involving connected parties. These powers (which were included in the Small Business, Enterprise and Employment Act 2015) expire in May 2020. It is possible that the low rate of referrals might prompt the government to introduce further reforms – for instance making the pool referral process mandatory, but equally it could decide that formal measures are not required. strengthening corporate governance in pre-insolvency situations. The consultation closed in June 2018. 1 Ian Johnson is a partner at Slaughter and May. The author would like to thank Nicky Ellis, a professional support lawyer at Slaughter and May, for her assistance in preparing this chapter. 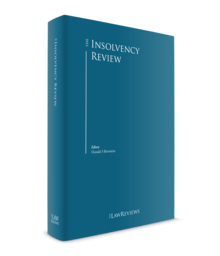 2 The term 'UK insolvency law' is used in this chapter to denote the insolvency laws applicable to England and Wales. Similar laws apply, with modifications, to Scotland and Northern Ireland. 3 These came into force on 6 April 2016, in most cases replacing the Insolvency Rules 1986 in their entirety. 4 With certain significant exceptions, such as the Financial Collateral Arrangements (No. 2) Regulations 2003 (implementing the EU Directive on Financial Collateral Arrangements, which aims to simplify the process of taking and enforcing financial collateral across the EU). The regulations disapply a number of provisions of the IA 1986, including the moratorium on enforcement of security in insolvency processes such as administration and company voluntary arrangements and the order of priority of claims in floating charge realisations. 5 References to 'EU Member State' in the remainder of this chapter should be taken to mean an EU Member State other than Denmark. 6 Main and secondary proceedings for the purposes of the Recast ECIR must be 'collective insolvency proceedings' and are listed in Annex A to the ECIR. Those relevant to corporate insolvencies in the UK are: winding up by or subject to the supervision of the court; creditors' voluntary liquidation (with confirmation by the court); administration (including out-of-court appointments) and voluntary arrangements. 7 Under the Recast ECIR, the presumption does not arise if the registered office has been moved to another Member State in the three-month period before the request for the opening of insolvency proceedings. 8 Under the Original ECIR, such secondary proceedings had to be winding-up proceedings, and were listed in Annex B. The Recast ECIR has removed this restriction. 9 Broadly defined as a floating charge over the whole or substantially the whole of the company's property. 10 See Sections 220 to 221 of the IA 1986, which allow for the winding up of foreign companies as unregistered companies. 11 It is not possible to appoint an administrative receiver in respect of a company incorporated outside the UK. 12 As discussed in Section I.v, the court may refuse to open secondary proceedings if an undertaking to respect local priorities is in place. 13 Re a company (No. 003102 of 1991) ex p Nyckeln Finance Co Ltd  BCLC 539. 14 For example, Hellas Telecommunications (Luxembourg) II SCA  EWHC 3199 (Ch). 15 A Statement of Insolvency Practice (SIP 16 – Pre-packaged Sales in Administration) was introduced to ensure greater transparency of pre-packs. It sets out the required disclosures that an administrator must make to creditors of the details of any pre-pack agreement and sale. 16 A pre-pack administration can also be combined with a scheme, as seen in the IMO Carwash and McCarthy & Stone restructurings. 17 Under the Original ECIR, the circumstances in which administration could be used as a secondary proceeding were limited, as secondary proceedings are restricted to winding-up proceedings. 18 But note the exception provided by Section 426 of the IA 1986 that permits the English courts to assist courts having insolvency jurisdiction in other 'relevant countries': in Re Dallhold Estates (UK) Pty Ltd  BCC 394 the court acceded to the request of a Western Australian court to grant an administration order in respect of an Australian company with assets in this jurisdiction. 19 The IA 1986 and IR 2016 set out various 'decision procedures' that may be used when creditors are required to make a decision. Many of these decisions would previously have been made at physical creditors' meetings, but since the IR 2016 came into force on 6 April 2017, such meetings are now permitted only if the requisite proportion of creditors so request. Challenges on the grounds of unfair prejudice are possible in some circumstances – see further Section I.iv). 20 The CVA becomes effective immediately after the resolution to approve it has been passed (for which 14 days' notice is required). 21 A CVA is not specifically listed as a winding-up proceeding for the purposes of Annex B to the Original ECIR. Arguably though, if it is not effected within a liquidation or administration, it can be proposed as a means of terminating secondary proceedings for the purposes of the Original ECIR on the basis that it amounts to a 'composition' (see Article 34). The Original ECIR provides that closure in this way requires the consent of the liquidator in the main proceedings but, in the absence of such consent, it may become final if the financial interests of the creditors in the main proceedings are not affected by the measure proposed. The scope of secondary proceedings under the Recast ECIR is no longer limited to winding-up proceedings. 22 The English courts' jurisdiction to sanction a scheme hinges on their jurisdiction to wind up the scheme company in question (the criteria for which are discussed earlier in this Section). 23 The court has, however, stayed proceedings for summary judgment in a case where steps to implement a scheme were well advanced and it had a reasonable prospect of success: Re Vietnam Shipbuilding Industry Group & Ors  EWHC (Comm) 1146. 24 For example, the scheme proposed by DTEK Finance Plc in April 2016, which provided the group with a moratorium in which to negotiate a restructuring. 25 Including those whose COMIs are located in another EU Member State. The English courts' jurisdiction in relation to schemes of foreign companies has been found not to have been fettered by the ECIR: see Re Drax Holdings; Re Inpower  EWHC 2743 (convening hearing: 17 November 2003) and Re Dap Holding NV  EWHC 2092 (sanction hearing: 26 September 2005). 26 See, for example, the decisions relating to Tele Columbus, Rodenstock, PrimaCom, Seat Pagine, Vivacom, Cortefiel and Zlomrex. 27 E.g., Re Apcoa Parking Holdings GmbH & Ors  EWHC 1867 and DTEK Finance BV, Re  EWHC 1164 (Ch), where the governing law in an indenture relating to high-yield bonds was changed from New York law to English law before the scheme application was made. 28 E.g., Chapter 15 of the US Bankruptcy Code, which implements the Model Law in the United States, amended the definition of 'foreign proceedings' to include 'adjustment of debt', which may include certain schemes of arrangement. 29 If the company is in administration or liquidation, the administrator or liquidator will usually act as the nominee. 30 Unless the liquidator or administrator is acting as nominee, in which case he or she does not need to report to the court, but proceeds straight to the decision-making stage. 31 See Practice Statement (Scheme of Arrangements with Creditors)  All ER (D) 57 (Apr), the purpose of which is to enable issues concerning the composition of classes of creditor and the summoning of meetings to be identified and, if appropriate, resolved early in the proceedings. 32 Practice Statement (Companies: Schemes of Arrangement)  1 WLR 1345. 33 Peninsula and Oriental Steam Navigation Company  EWHC 389. 34 An official receiver (appointed in a compulsory liquidation) is not subject to such a regime. He or she is an officer of the court and responsible directly to it and to the relevant secretary of state. 35 The procedure is to be used only where there has been a transfer of part of a failing bank's business, assets or liabilities to a bridge bank or a private sector purchaser under the special resolution regime, leaving an insolvent residual entity. It is designed to ensure that essential services and facilities that cannot be immediately transferred to the bridge bank or private purchaser continue to be provided for a period of time. 36 The Investment Bank Special Administration Regulations 2011 (SI 2011/245). These regulations have been supplemented by the Investment Bank Special Administration (England and Wales) Rules 2011 (SI 2011/1301). 37 The bail-in mechanism included in the 2013 Act was closely modelled on the Bank Recovery and Resolution Directive when it was in draft form, while the legislation introduced on 1 January 2015 included the amendments that were necessary to ensure that it was fully compliant with that Directive. 38 Section 17 of and Schedule 2 to the Financial Services (Banking Reform) Act 2013. 39 The Insurers (Reorganisation and Winding Up) Regulations 2004 (SI 2004/353). Separate regulations apply to Lloyd's insurers: see the Insurers (Reorganisation and Winding Up) (Lloyd's) Regulations 2005 (SI 2005/1998). 40 Note, however, the existence of a number of statutes that provide for company groups to be considered as one entity in non-insolvency situations, for example, the CA 2006 with the concept of group accounting; and taxation legislation with concepts such as 'controlling interests' and group taxation and tax relief. 41 Typically, this will be where the COMI of the parent, provided it has 'command and control' of the group, is located. See, for example, Re Daisytek-ISA Ltd  BCC 562 and Re MG Rover España SA  BCC 599. 42 See, for example, Collins & Aikman  BCC 861 and Nortel Networks SA  BCC 343. 43 See MPOTEC (EMTEC) GmbH  BCC 681. 44 Legislative Guide on Insolvency Law, Part Three: Treatment of Enterprise Groups in Insolvency adopted by UNCITRAL on 5 July 2010 and published on 21 July 2010. Elsewhere, INSOL Europe has recommended the introduction of group proceedings. 45 See the UNCITRAL Practice Guide on Cross-Border Insolvency Cooperation (adopted 1 July 2009). 46 Note, too, the Foreign Judgments (Reciprocal Enforcement) Act 1933, which provides for enforcement in England of civil and commercial judgments made in designated jurisdictions, provided that the judgment has been registered under that statute. 47 Re Arena Corporation Ltd  All ER (D) 277. 48 Recital (33) of the ECIR confirms that Denmark, which exercised its opt-out in relation to the ECIR, is not to be regarded as a Member State for the purposes of the ECIR. 49 The English courts may refuse to provide assistance under the CBIR if it would be manifestly contrary to public policy. 50 In cases of conflict between the obligations of the UK under the ECIR and the provisions of the CBIR, the ECIR will prevail. In essence, the CBIR provide an alternative basis for judicial cooperation where the ECIR does not apply, for example where the debtor's COMI is not situated in an EU Member State or where the type of proceeding (or foreign representative) in question is not covered by the ECIR, or to the extent that they do not conflict with the ECIR. 51 Rubin & Anor v. Eurofinance SA & Ors  UKSC 46 (24 October 2012). 52 See the opinions of Advocate General Colomer, delivered to the European Court of Justice in Case C-1/04 Staubitz-Schreiber  ECR 1-701 and Case C-339/07 Seagon v. Deko Marty Belgium NV  ECR-1-767. 53 An early example of 'good' forum shopping can be seen in the Schefenacker restructuring, where the holding company of a German automotive supplier moved ownership of its assets and liabilities to a new, English-registered holding company so that it could enter into a CVA. 54 Hellas Telecommunications (Luxembourg) II SCA  EWHC 3199 (Ch). 55 A key reason for the COMI shift was to facilitate a pre-pack sale of the company's main asset, its shares in the main trading telecoms company, to a new group company, leaving behind subordinated lenders as creditors of a company with no assets. 56 The Recast ECIR includes new language in relation to the determination of COMI, but the steps taken in this case are still likely to be relevant. 57 Van Gansewinkel Groep BV & Ors, Re  EWHC 2151 (Ch) (22 July 2015). 58 Snowden J found that the number of scheme creditors domiciled in England (15 of the 106 creditors, spread across the classes) and the size of their claims (€135 million in total) were sufficient to make it expedient for all scheme claims to be determined together. 59 ONS Quarterly National Accounts: Jan to Mar 2018, 29 June 2018. 60 HM Treasury, 'Forecasts for the UK economy: a comparison of independent forecasts', June 2018. 61 ONS Statistical Bulletin, 'UK Labour Market: June 2018', 12 June 2018. 62 Bank of England 'Inflation Report', May 2018. 63 Monetary Policy Summary and minutes of the Monetary Policy Committee meeting ending on 1 November 2017, 2 November 2017. 64 Monetary Policy Summary and minutes of the Monetary Policy Committee meeting ending on 20 June 2018, 21 June 2018. 65 Bank of England Credit Conditions Review 2018 Q1, p. 4. 66 Bank of England Credit Conditions Review 2018 Q1, pp. 6–7. 69 Following certain changes to claimable expense rules, a large number of connected personal service companies have entered liquidation. As these liquidations were driven by rule changes, excluding these companies from the data gives a more accurate picture of the underlying trends in the economy. 70 Again, excluding the personal services companies from the data in order to show the underlying trends. 71 Insolvency Service, 'Insolvency Statistics – January to March 2018', 27 April 2018. 72 Practical Law, 'What's Market – Company Administrations Trends Report' 2017 and Q1 2018. This report breaks out the sectors slightly differently: constructions and industrials are grouped together. 73 Bloomberg, 'How Toys 'R' Us Collapsed So Quickly', 19 September 2017. 75 Sky News, 'Toys R Us close to winning PPF backing to avert risk of collapse', 21 December 2017. 76 Sky News, 'Toys R Us rescue deal is saved by pension settlement', 21 December 2017. 77 Sky News, 'Taxman takes ailing Toys R Us to the brink with £15m VAT demand', 16 February 2018. 78 Moorfields Advisory announcement, 28 February 2018. 79 Financial Times, 'Toys R Us to shut final UK stores by end of April', 12 April 2018. 80 The Telegraph, 'Jamie's Italian confirms closures and rent cuts as part of rescue deal', 9 February 2018. 81 Chairman's report on the Meetings of the Company and Creditors, 12 February 2018. 82 Mothercare RNS release, 17 May 2018. 83 Mothercare RNS release, 9 July 2018. 86 New Look press release, 7 March 2018. 87 New Look press release, 21 March 2018. 88 New Look press release, 7 March 2018. 89 New Look press release, 21 March 2018. 90 House of Commons Briefing Paper Number 8,206, 14 March 2018. 92 Essentially a liability or impairment. 93 LBIE, a company of unlimited liability, was the Lehman group's main European broker-dealer and provided investment banking services on a global basis. It filed for administration on 15 September 2008. 94 Explanatory statement in relation to a scheme of arrangement between LBIE and its scheme creditors, circulated on 14 May 2018 and updated on 31 May 2018. 95  EWHC 59 (Ch), 18 January 2016. For the original recognition application, see OJSC International Bank of Azerbaijan, Re  EWHC 2075 (Ch), and the decision to lift the moratorium in part,  EWHC 792 (Ch). 96 Draft Agreement on the withdrawal of the United Kingdom of Great Britain and Northern Ireland from the European Union and the European Atomic Energy Community, published 19 March 2018, joint progress statement from the negotiators dated 19 June 2018. 97 Draft Agreement on the withdrawal of the United Kingdom of Great Britain and Northern Ireland from the European Union and the European Atomic Energy Community, published 19 March 2018, joint progress statement from the negotiators dated 19 June 2018. 98 Pre-pack Pool Annual Review 2017, May 2018.